with an existing lesson plan of 2-3 learning activities to be completed in one class period. Simply shift the list from vertical to horizontal so the activities are all happening synchronously at stations. ranging in rigor. 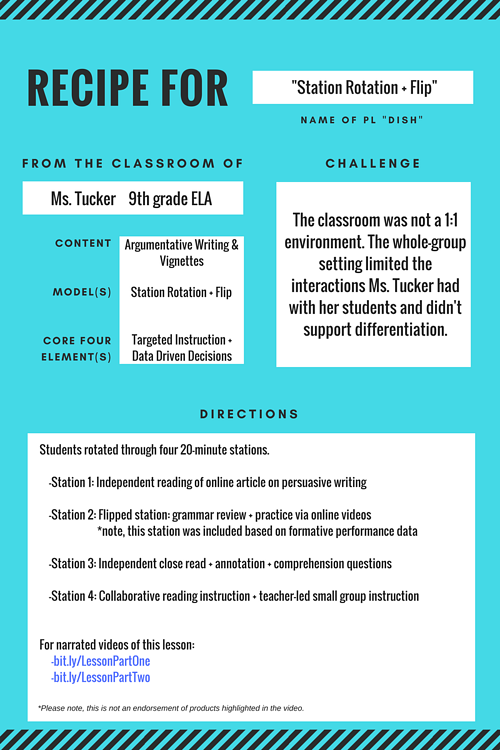 For example, each station might tackle a different DOK level. best experienced in a variety of settings: independent, collaborative, or with a teacher. who are just beginning to manage their time and learning. with an existing lesson plan of multiple resources, learning tasks, and formative checks. Convert the lesson plan into a playlist! Get started here. who are interested in competency-based learning. Playlists are a great start, especially if there are formative assessments that must be mastered before progressing to the next activity. who are absent and don’t want students to lose instructional time. who are building soft skills such as time management, ownership, and reflection. who wish they could provide real-time feedback to students while they’re completing their practice homework activities. I like to think of the three instructional models as the key ingredients in my personalized learning pantry. Each ingredient is lovely on its own; however, the magic happens when I strategically blend them to create a delicious dish. I also always add seasoning and spice to enhance my ingredients; teachers do the same thing by layering elements of the Core Four into their instructional model. So, how does this model blending and layering work in the classroom? It happens everyday, in fact. These are not static decisions made once per year. 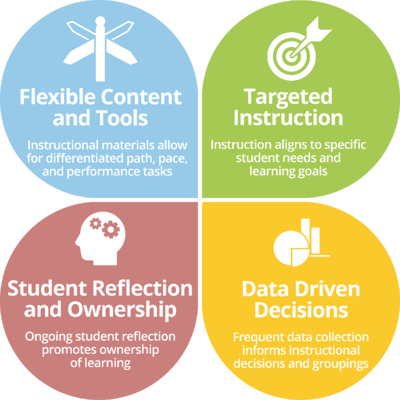 Teachers pick instructional models and personalized learning tactics for each and every lesson. 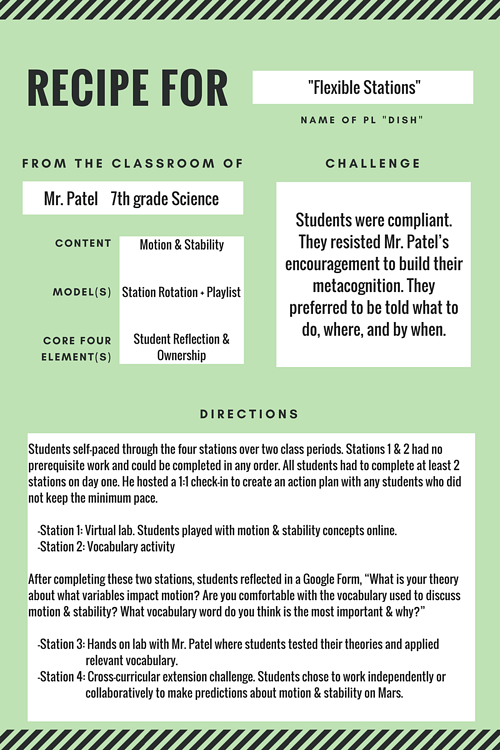 Consider your content: Which instructional model might it pair well with this content? Do I plan to differentiate content based on student interests or needs? Was this content tricky/engaging/boring for my students last year? What resources do I already have? Consider your students: Are there gaps in some students’ foundational knowledge of this topic I should consider? Which core four element(s) am I focused on right now? Do I want all of my students to learn the same content at the same time? Would my students benefit from time in a teacher-led small group? How can you get started in your personalized learning ‘kitchen’? 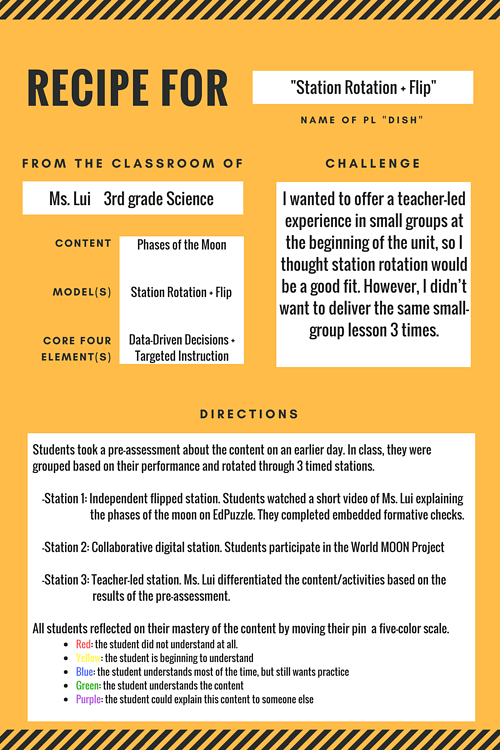 Start with a self-assessment: should you sample the key ingredients (station rotation, playlist, & flipped lesson) first to get a sense of what your personal tastes are, or are you ready to layer & experiment? When I started cooking, I prefered a prescribed, recipe-driven approach, but I quickly evolved to a more “what ingredients do I already have on hand?” strategy. Just like cooking, designing a personalized lesson is rarely perfect, and you will probably tweak the recipe each time. The moral of the story is to start wherever feels comfortable for you and your students. 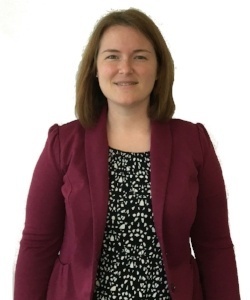 Brittany is a former Design Principal at Education Elements.